Joseph P. Cipko, 78, of Lansford, passed away on Wednesday, Nov. 11, 2015 at his residence. He was the husband of the late Catherine J. (McCartney) Cipko, who passed away on Nov. 15, 2005. Born in Coaldale, he was a son of the late Joseph and Isbael (Cheplik) Cipko. 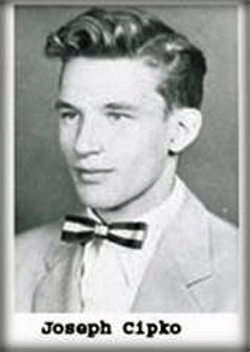 He was a graduate of the former Coaldale High School, Class of 1956. Joseph worked for Atlas Powder Company in Reynolds for 38 years, retiring in 1998. He served in the Army National Guard. Joseph was a member of the former St. Ann's Roman Catholic Church, and is a current member of St. Katharine Drexel Roman Catholic Church, both of Lansford. Surviving is a son, Joseph G. Cipko, and his wife Deborah, of Sinking Spring, Berks County; two daughters, Diane Cipko Vrablic of Brownsville, N.J., and Kathleen T. Schmoyer, and her husband Gerald, of Coopersburg; a brother, Dr. Robert Cipko of Southampton, PA; three sisters, Isabel Williams, and her husband Howard, of Coaldale, Deanna Goodman, and her husband William, of Lower Gwynedd, PA, and Lorraine Mancuso, and her husband Joseph, of Harrisburg; seven grandchildren and seven great-grandchildren; and several nieces and nephews. He was preceded in death by sisters, Joan Stianche and Dolores Techentin. Service: Mass of Christian Burial will be held on Saturday, Nov. 14, 2015 at 11 a.m. in St. Katharine Drexel Roman Catholic Church, 124 E. Abbott St., Lansford. Interment, St. Jerome's Cemetery, Tamaqua. Calling hours are Saturday from 10-11 a.m. in the church. Arrangements are being handled by the Skrabak-Parambo Funeral Home, 210 E. Bertsch St., Lansford.